Would you recommend Cap to a friend? PHers - stop using this app. it was great when just us cooler hipper early adopter influencers were on it. now you're ruining it with pictures of your mundane life. 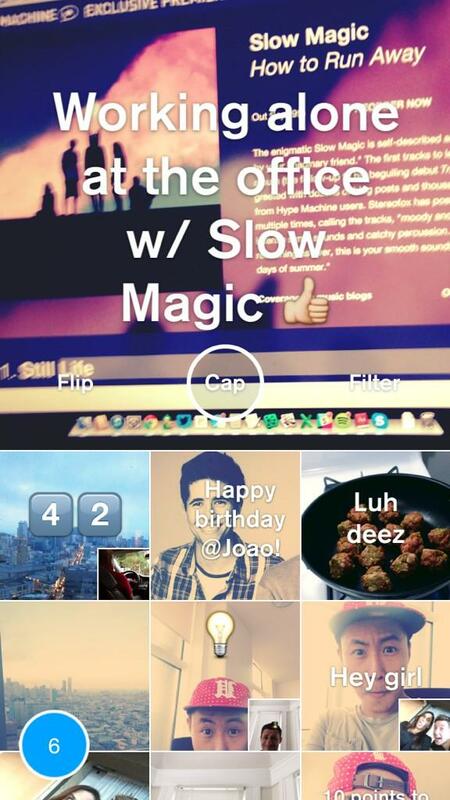 Beautiful app from @dtrinh, one of the original designers at Path. It’s a great and simple way to share all the fun stuff in your life that never feels right to post everywhere else. I love the simple grid of the timeline and how videos and photos can coexist so well. I've been playing with Cap for a few days now. As expected, coming from @dtrinh and team, it's beautiful. Here's a shot I took last night: Many people hate on new photo/video messaging apps, claiming the market's saturated and while that's true, there's always more room to explore new ways of communicating with people. For example, MessageMe has been one of the primary ways I communicate with my family back home. That said, why did you decide to build this of all things, @dtrinh? @dtrinh I see some similarities between what you're going for (at least as I understand it) and Path. Reading from the "backstage" article you linked to, one key is that the audience is not present; backstage you're performing for another group: the performers themselves. However, as far as I can tell with Cap, anyone can add anyone else and see their caps. Aren't we therefore still acting for a public audience? The logical leap I'm missing is how limiting the post to 24hrs creates a backstage mentality. A limited, reciprocal friending model like Path (especially in the early days) seems like a better strategy to change behaviors by creating a different audience for our digital sharing. Everyone on camera. Tap to watch or video chat with anyone.